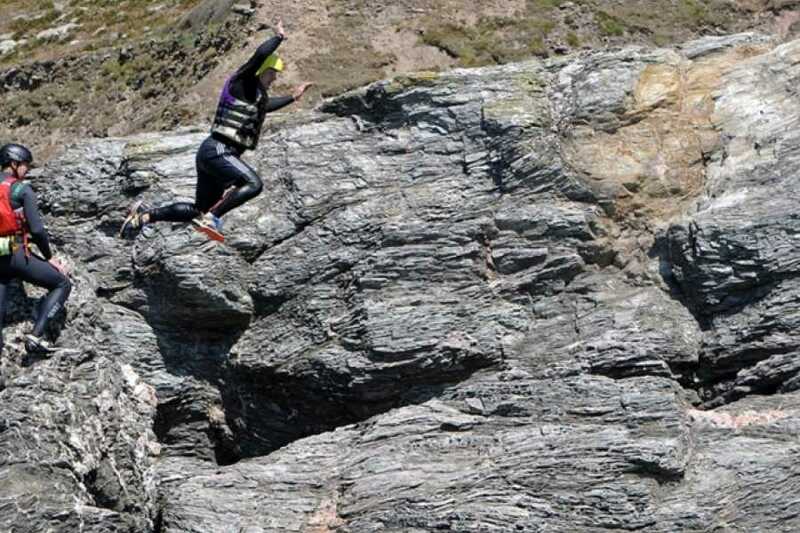 Session start at 9.30am or 1.30pm. 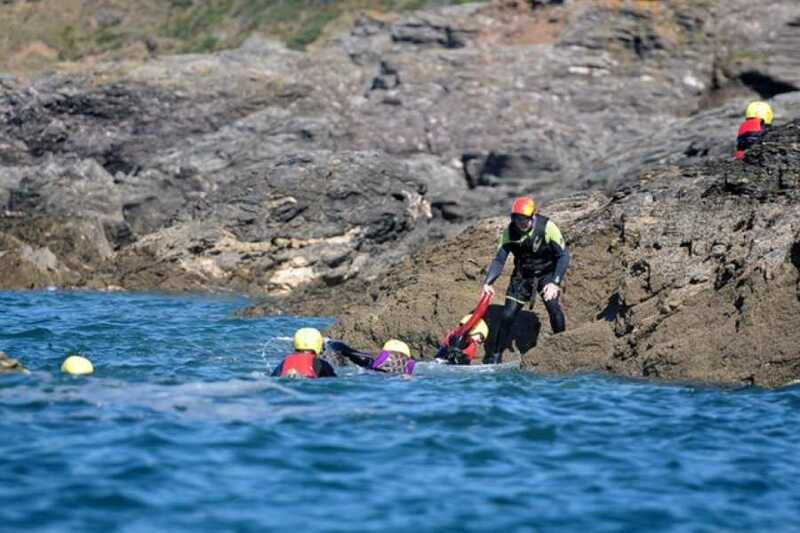 It is the law that anyone under the age of 18 years old has to be accompanied on the activity with a parent or guardian. 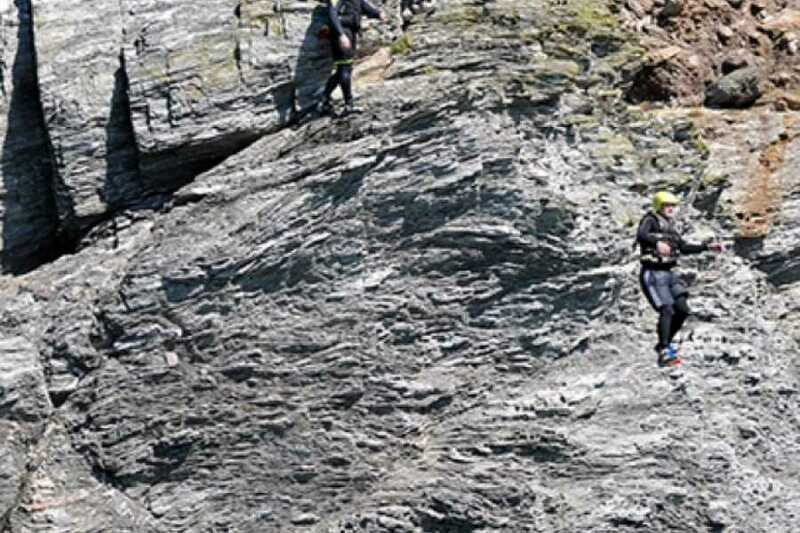 One parent can take up to three children. 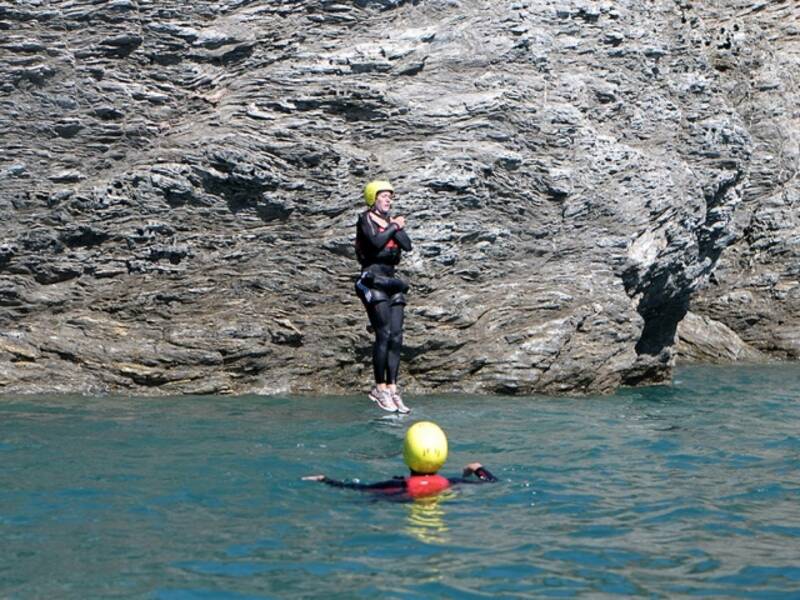 - Age, jumper size and height. 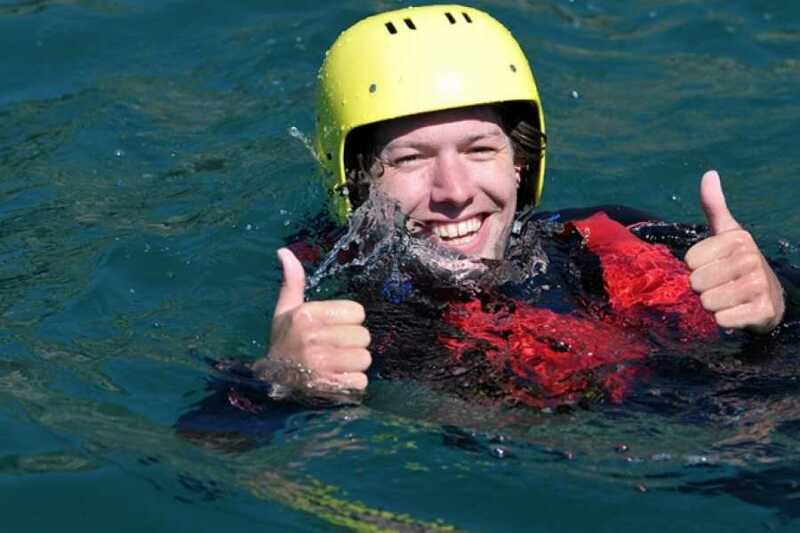 We provide Buoyancy aids, helmets and instructors. 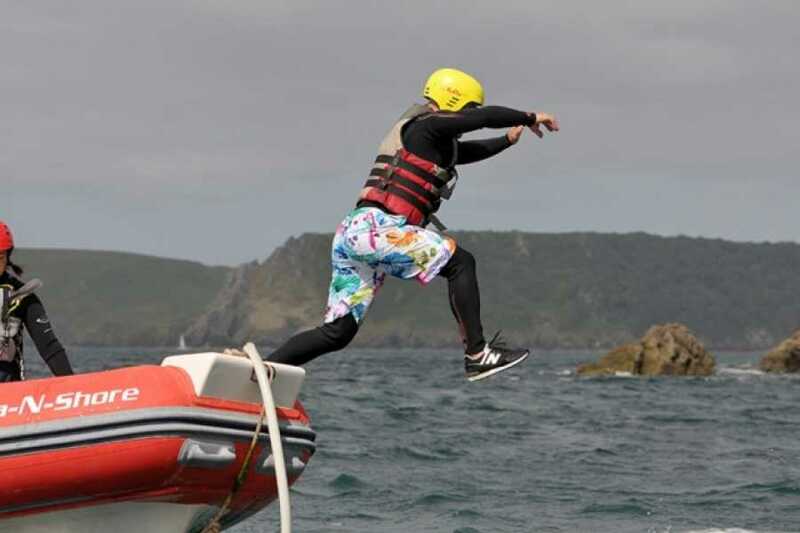 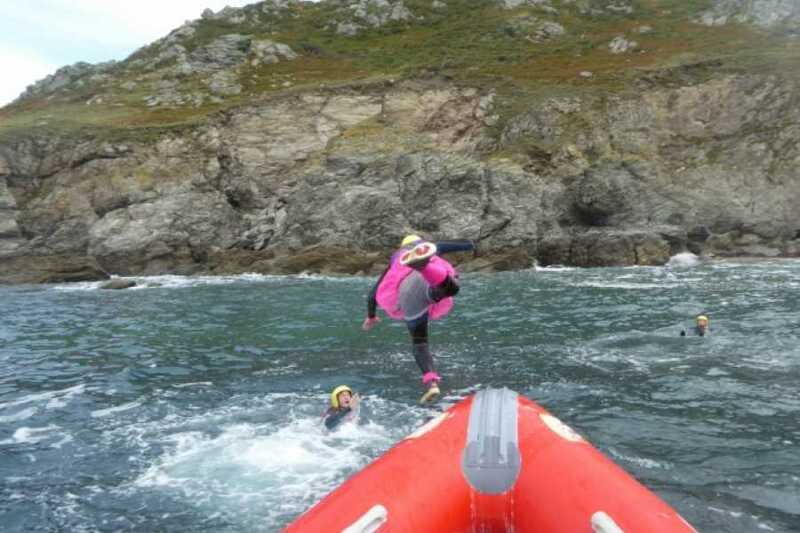 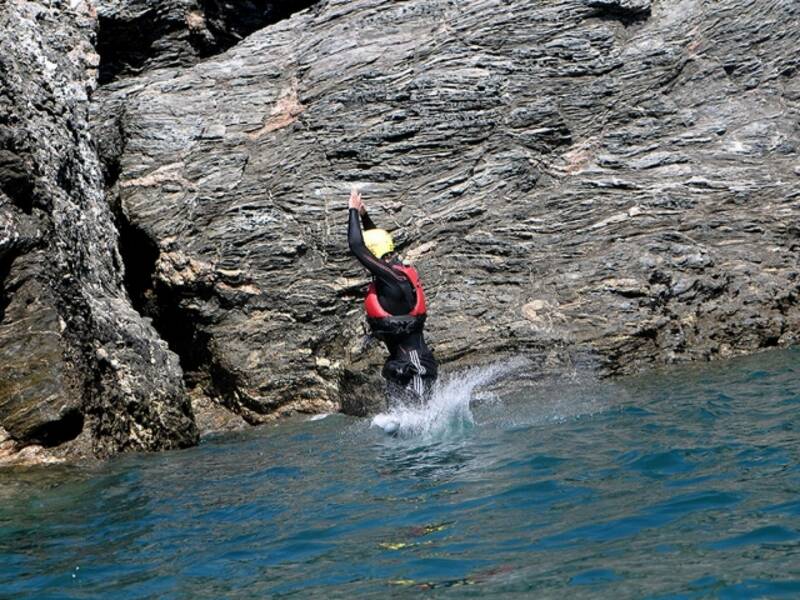 We ask you to provide your own old trainers, and baggy board shorts to go over the wetsuits to help the wetsuits not snag on rocks and also helps identify you in photos later. 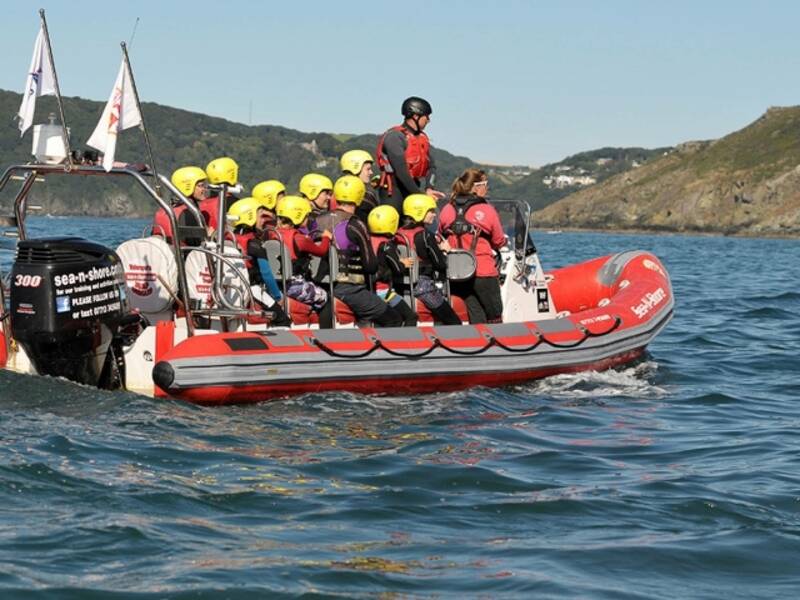 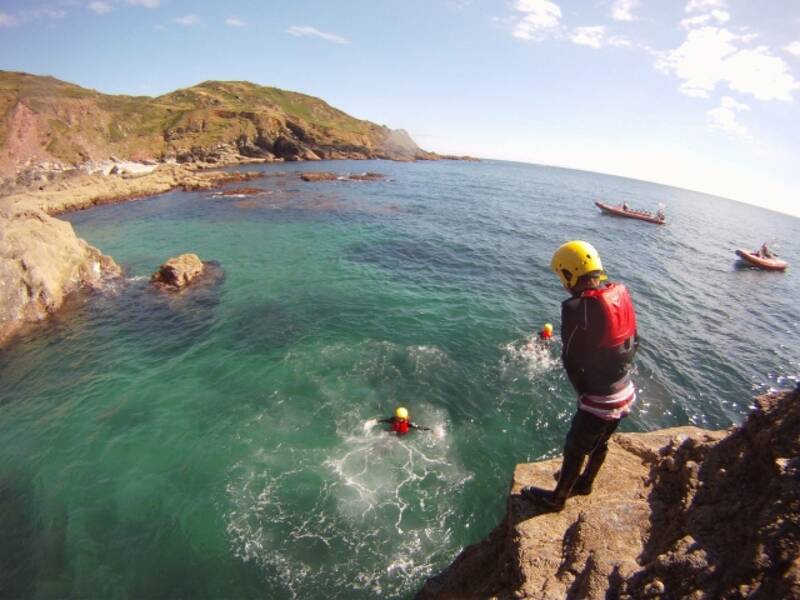 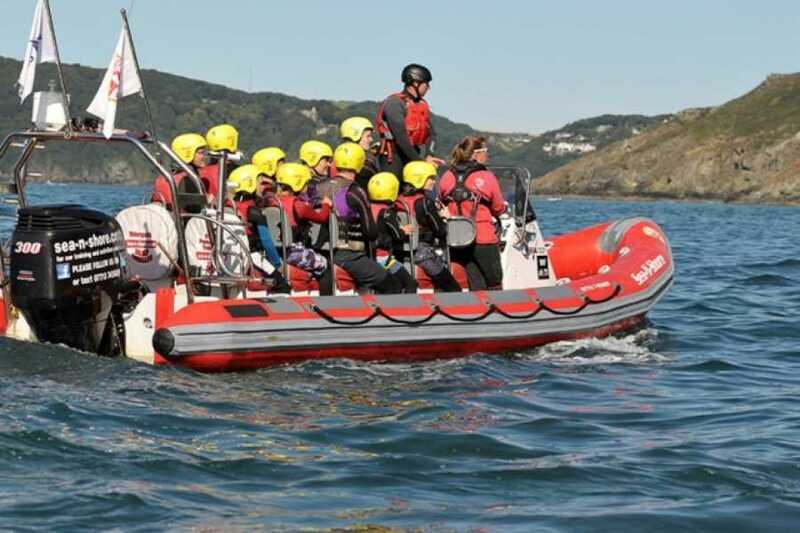 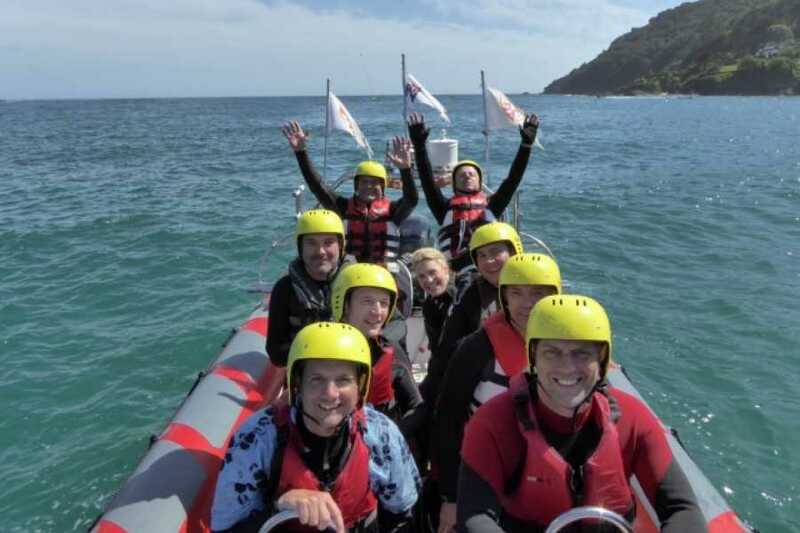 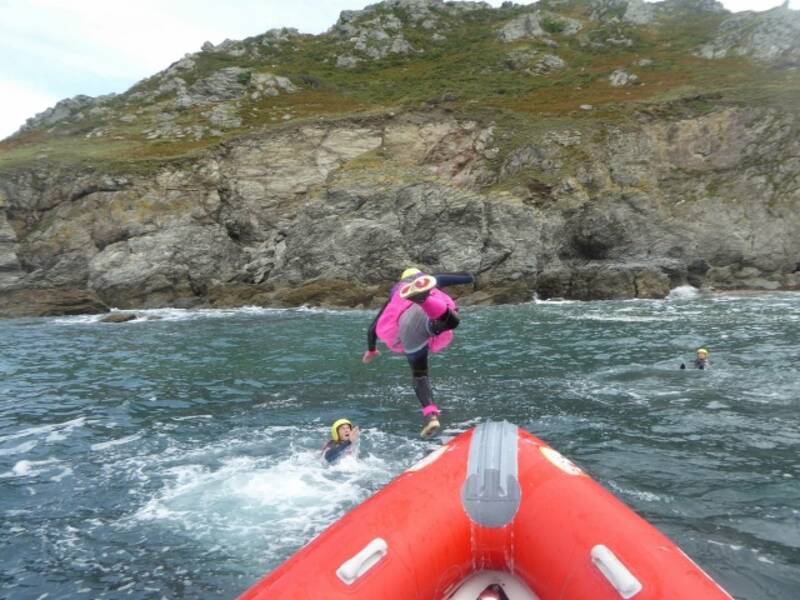 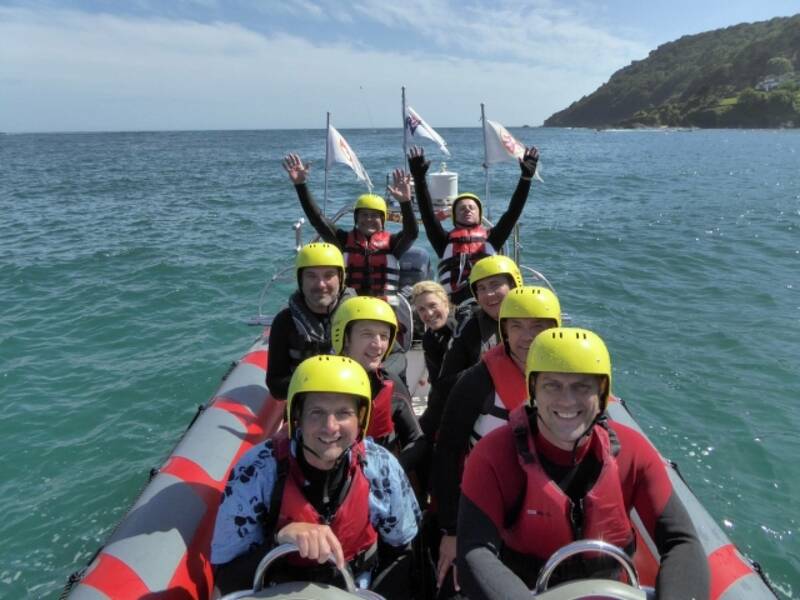 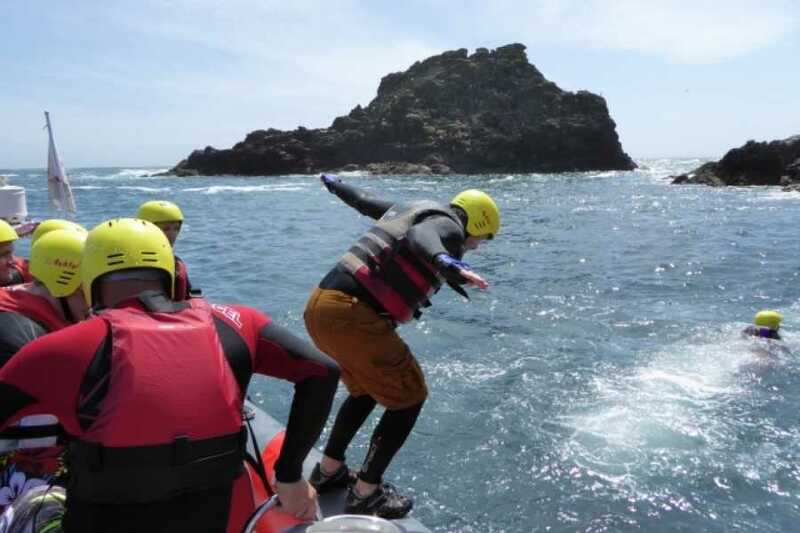 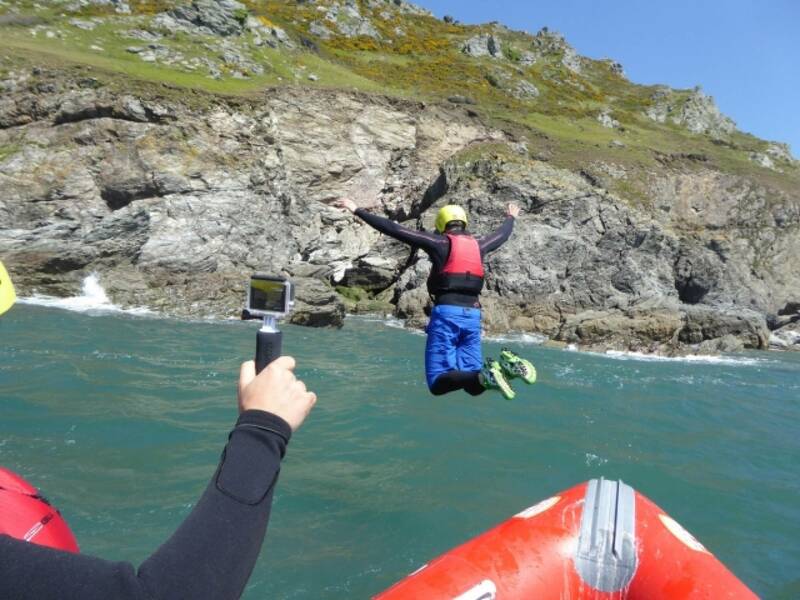 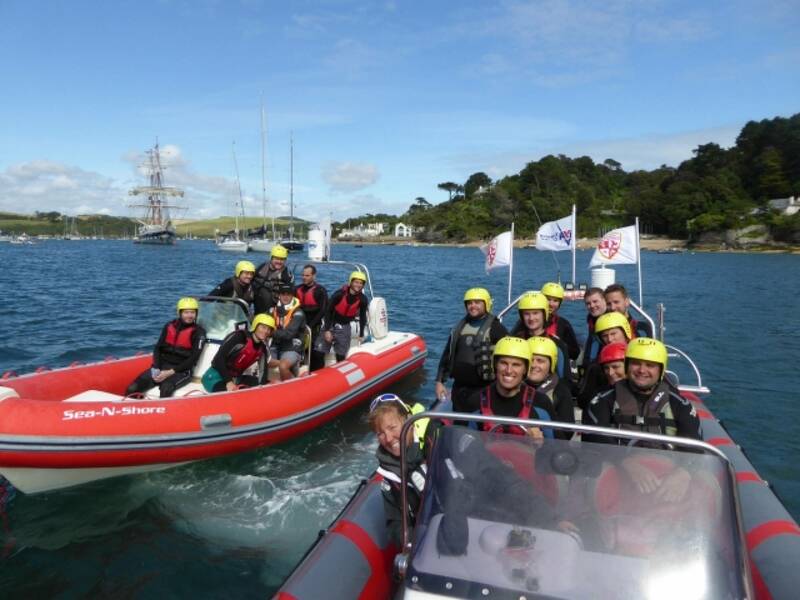 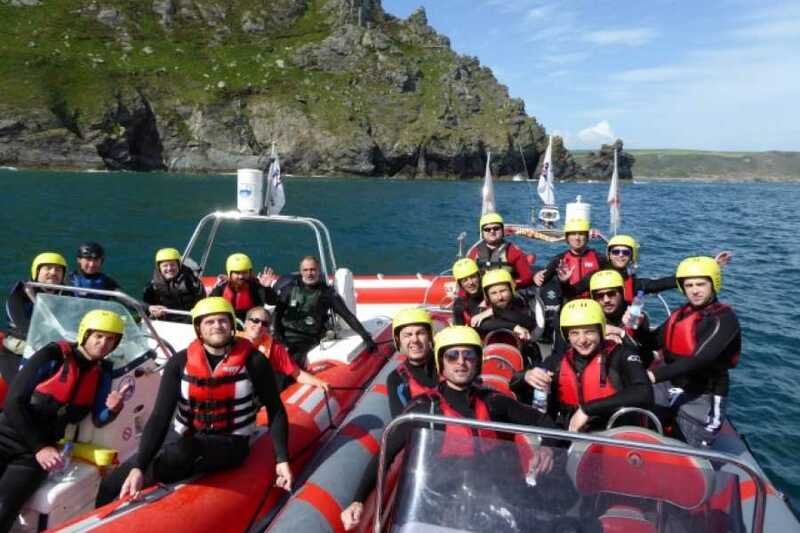 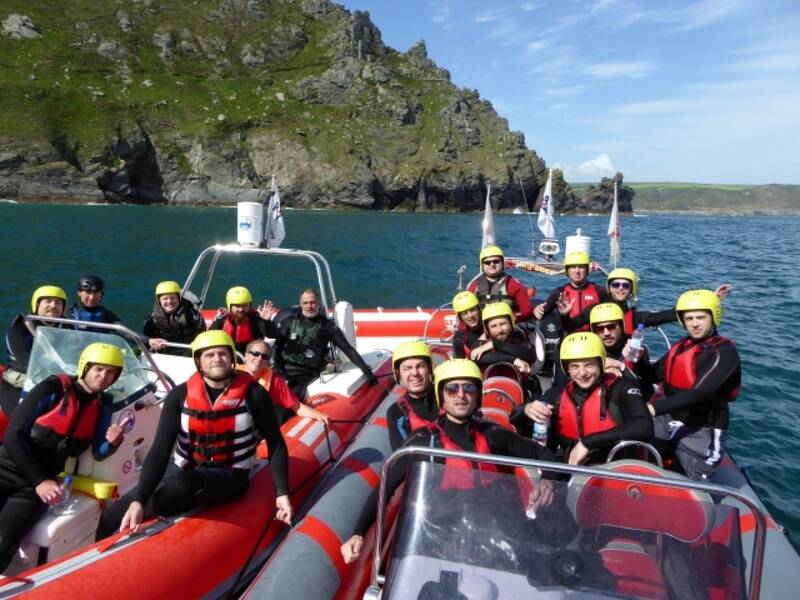 We run Rib Coasteering half day sessions when we have 8 or more customers booked in, and ribs, skippers and instructor(s) are available. 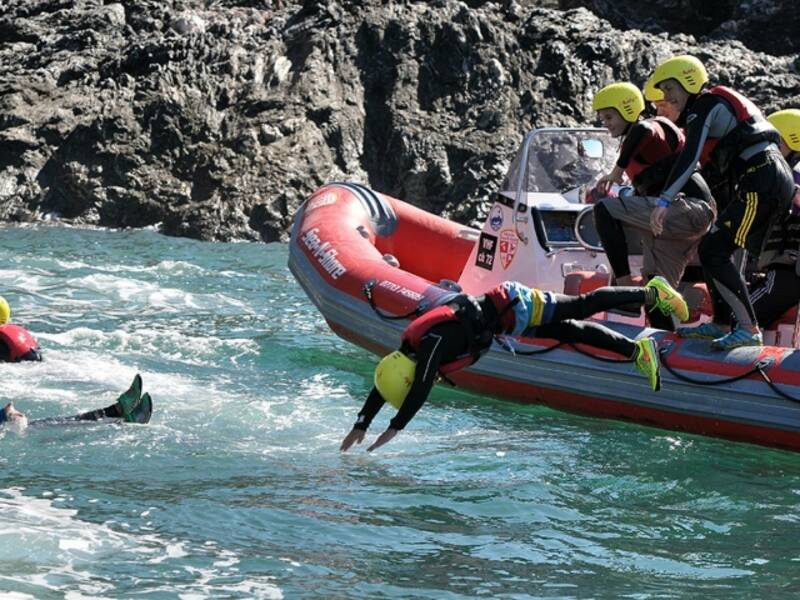 We allocate one instructor for 8 customers and all participants must be able to swim competently and in good health. 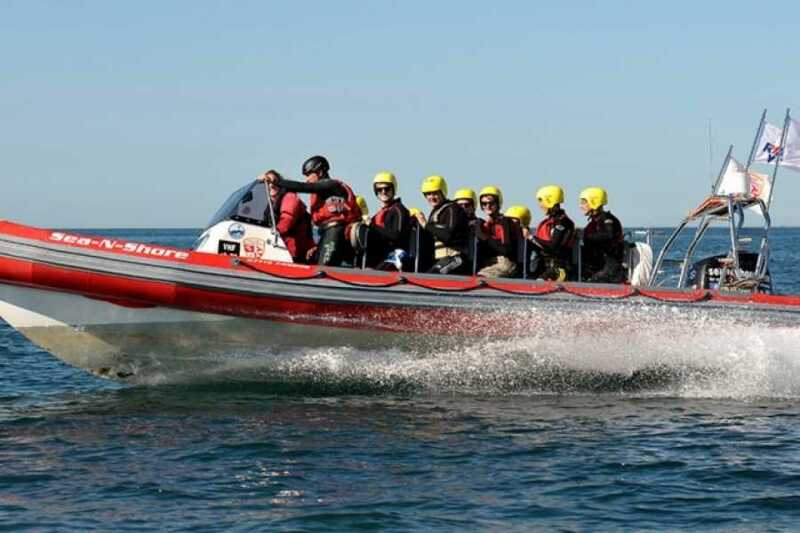 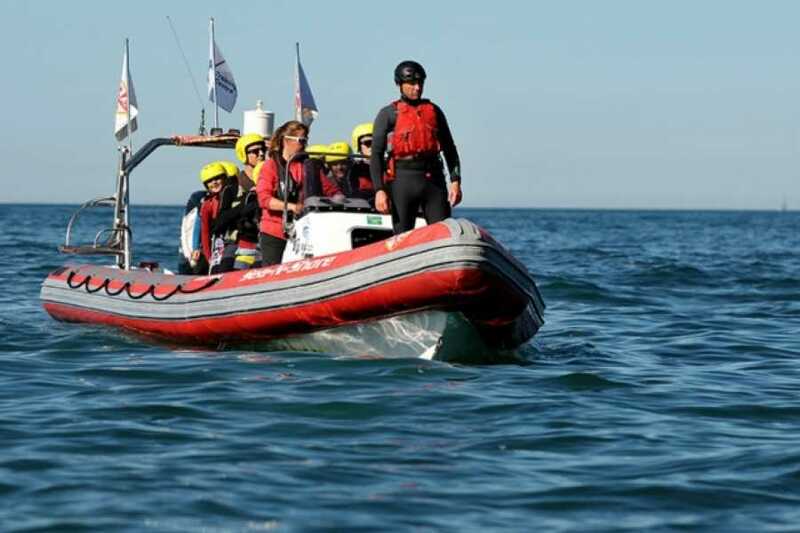 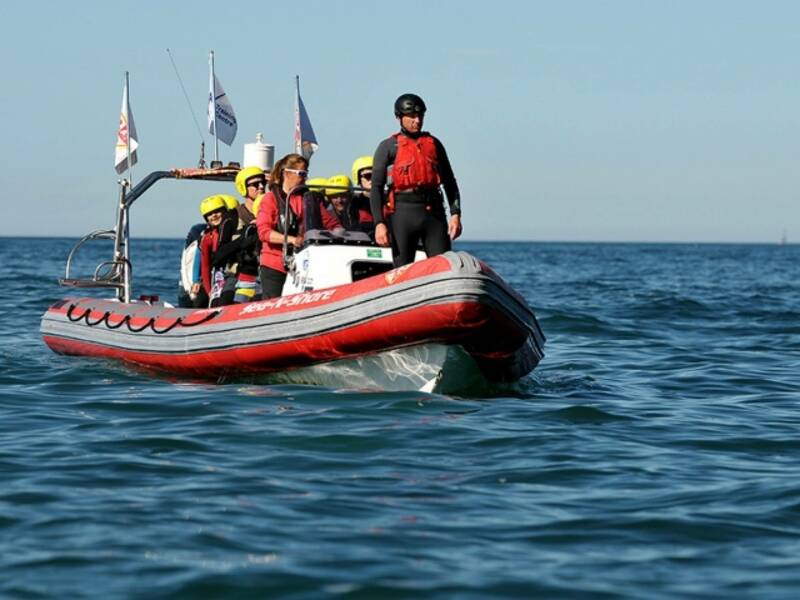 When we have more than 16 participants we then have a very good system between the two ribs where we shuttle you out to location with no time or safety lost for anyone’s activity. 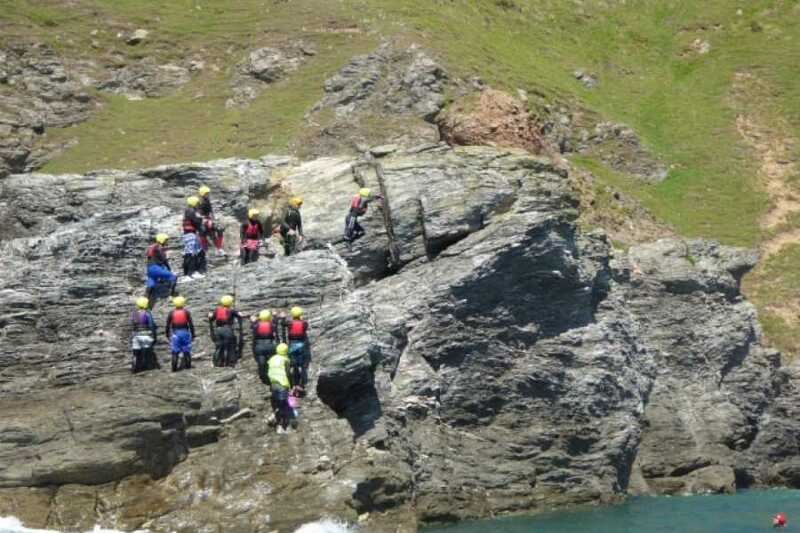 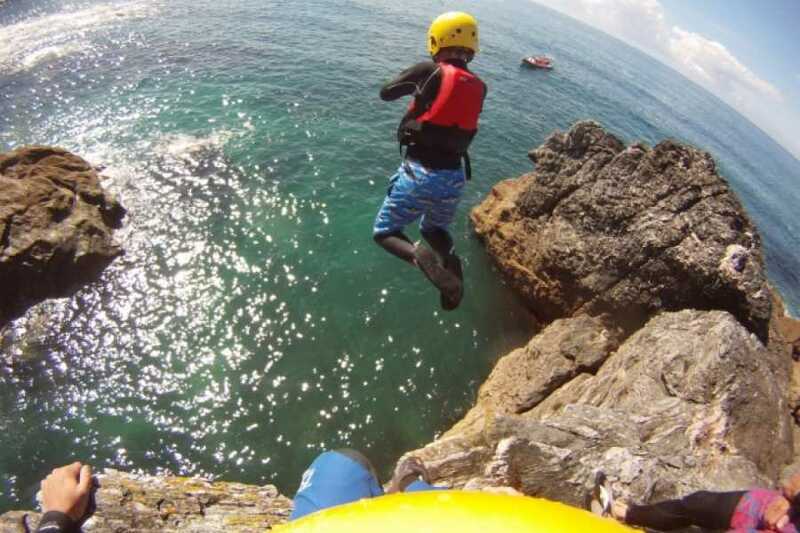 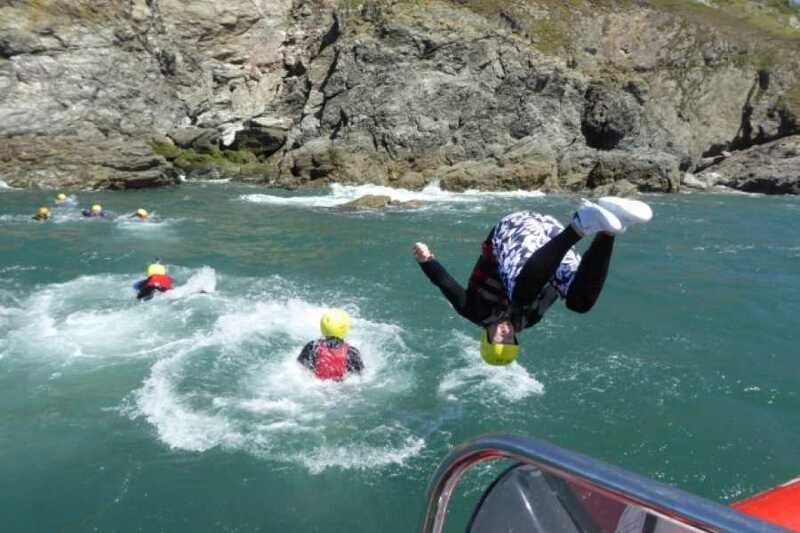 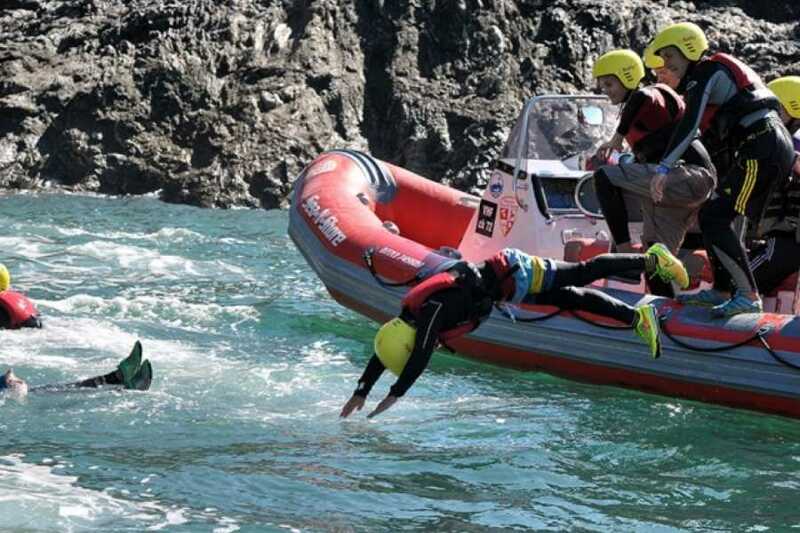 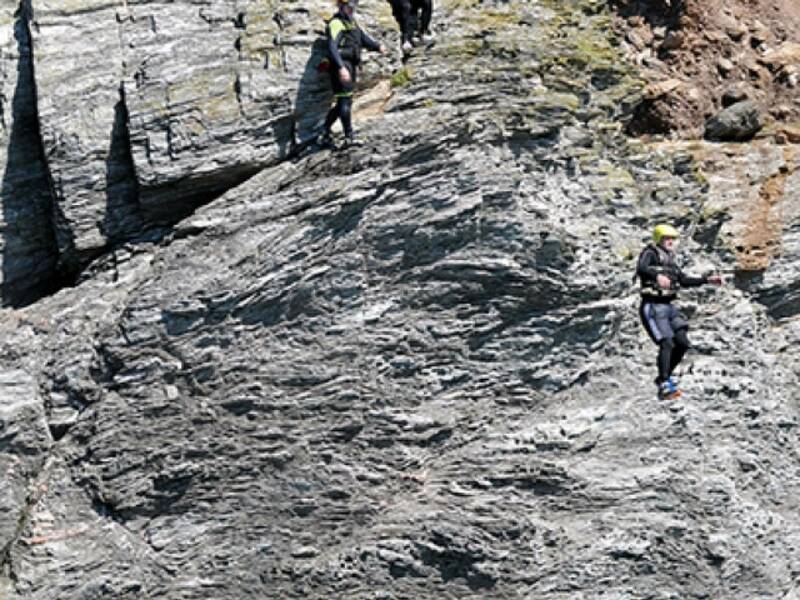 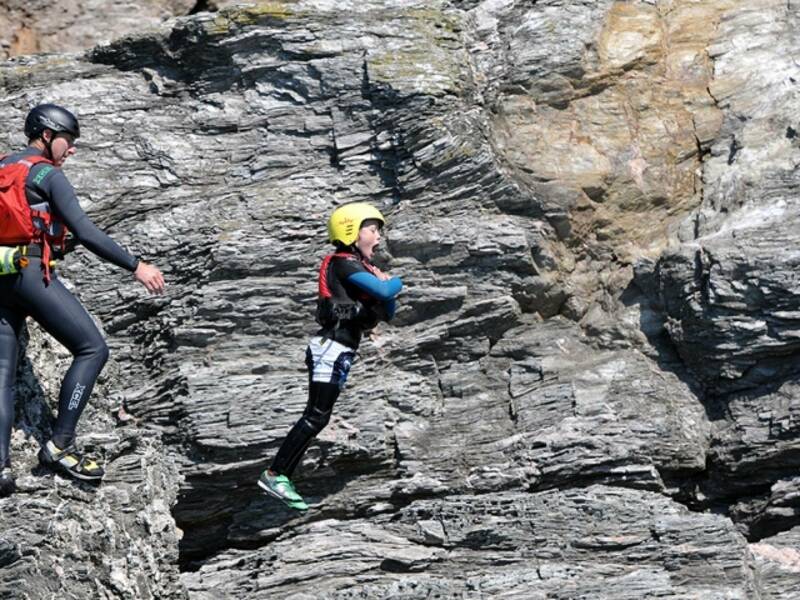 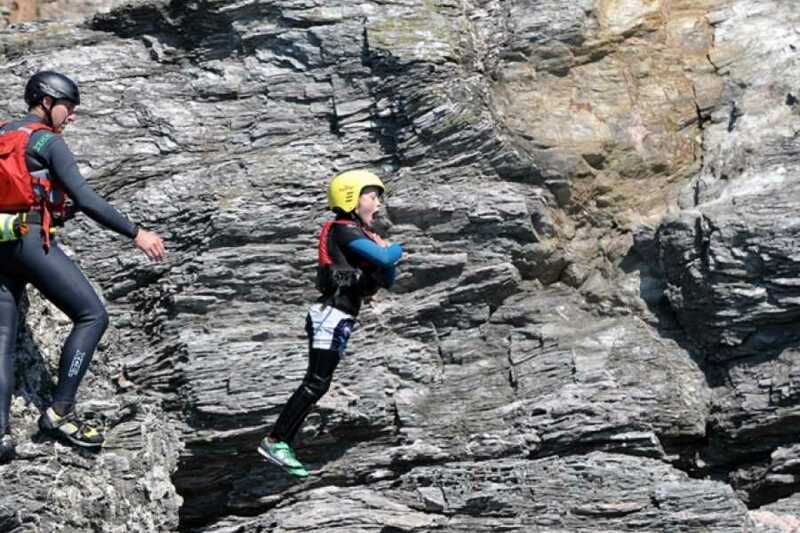 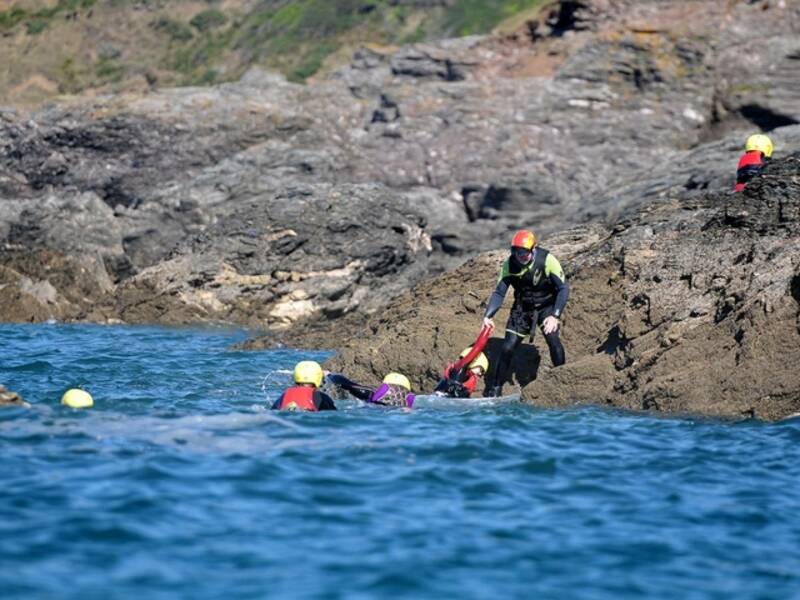 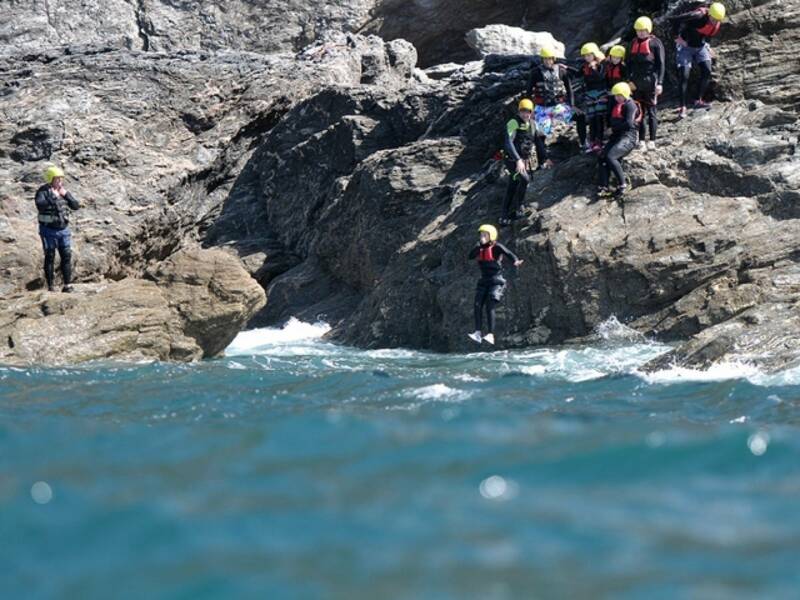 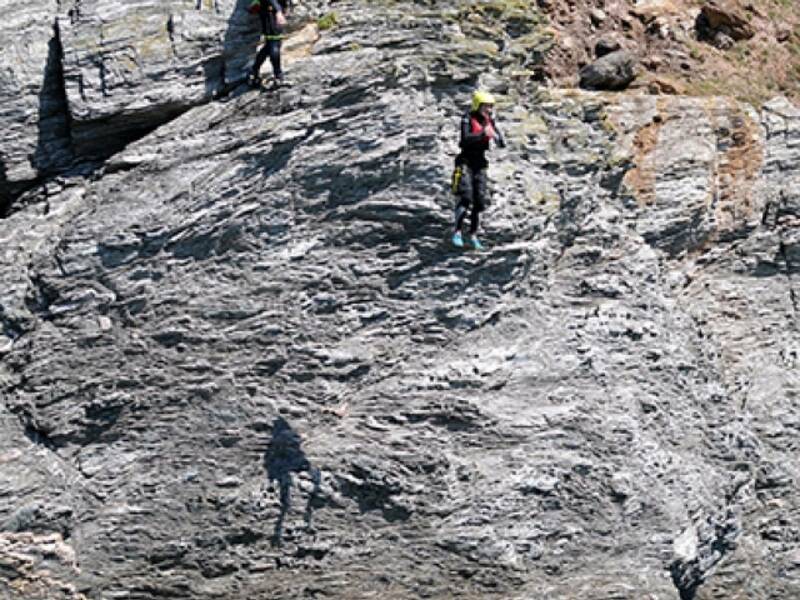 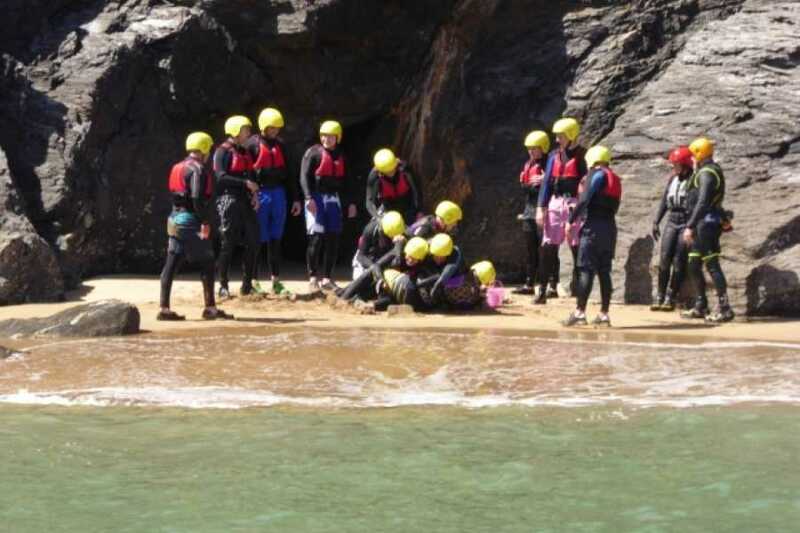 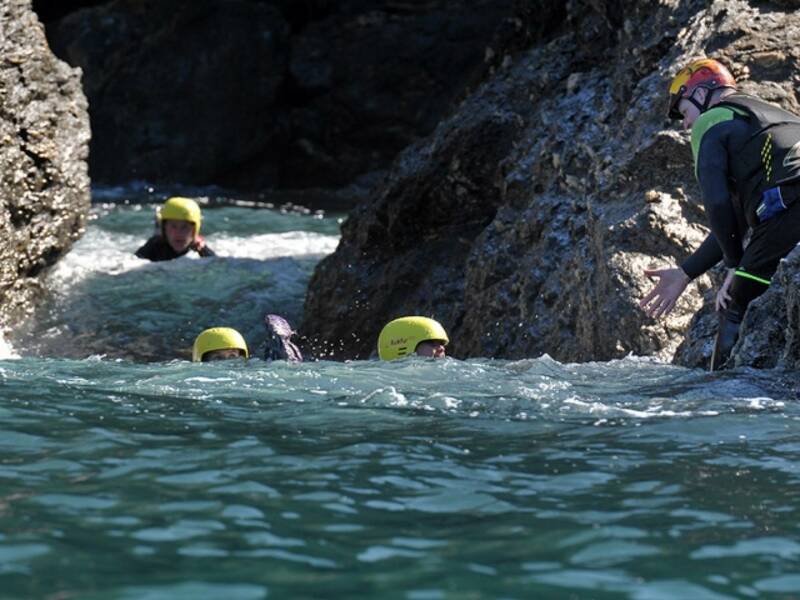 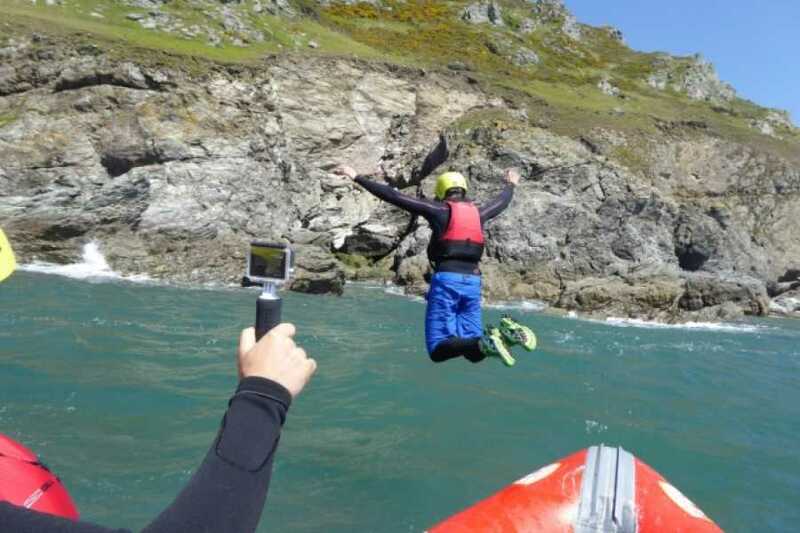 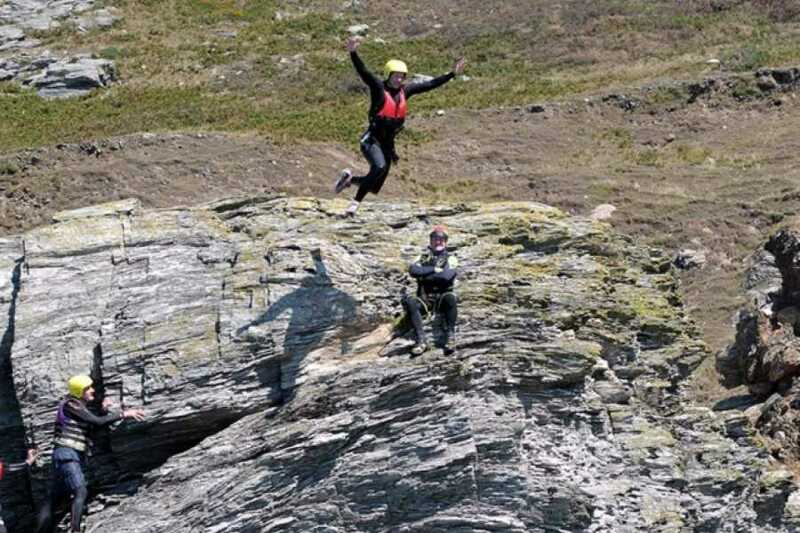 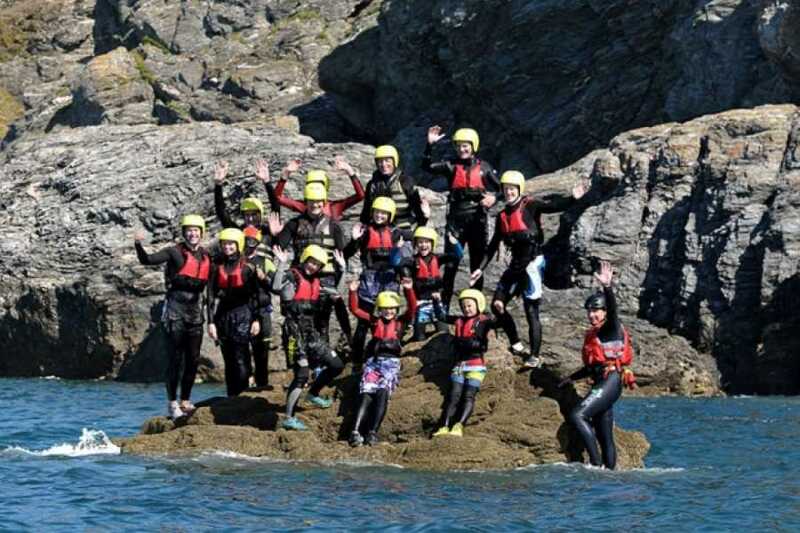 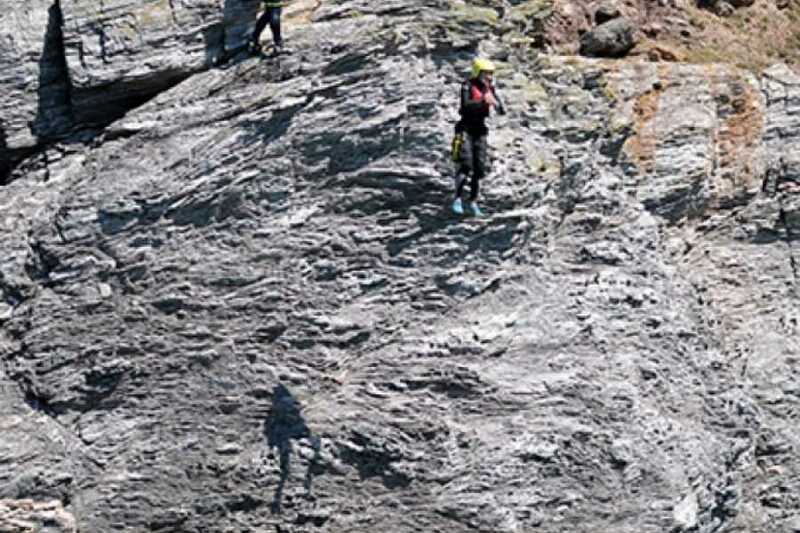 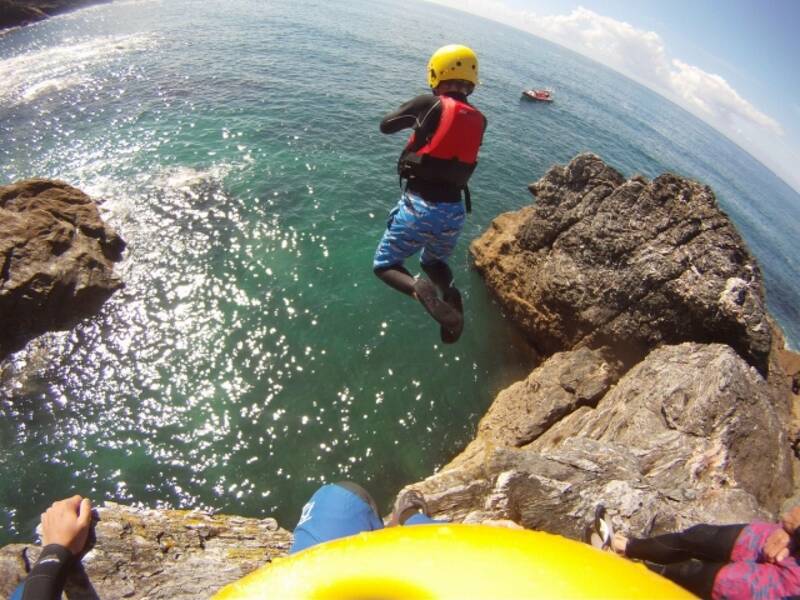 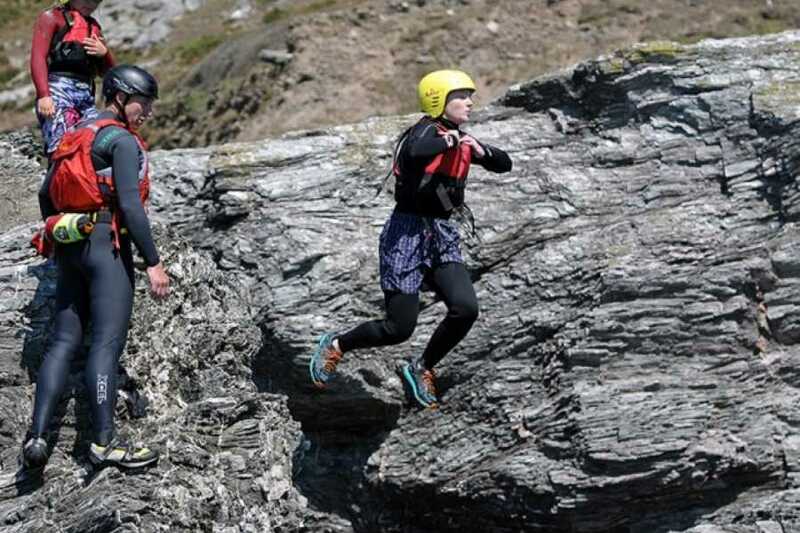 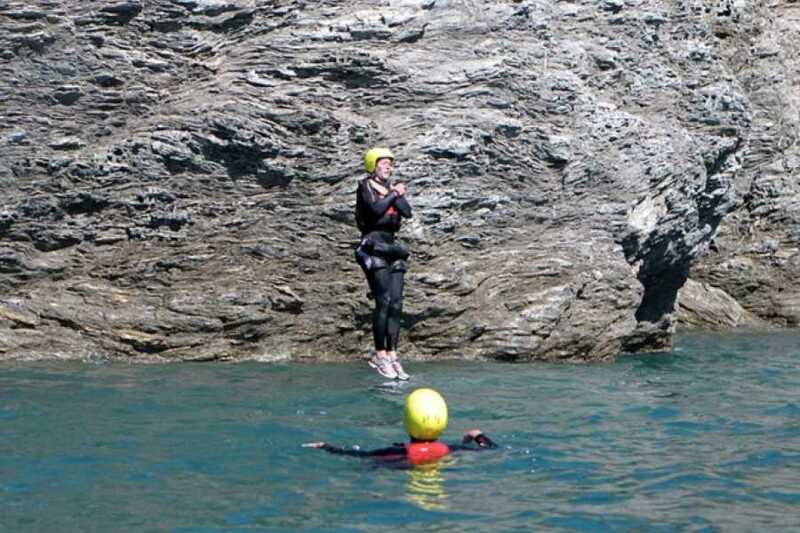 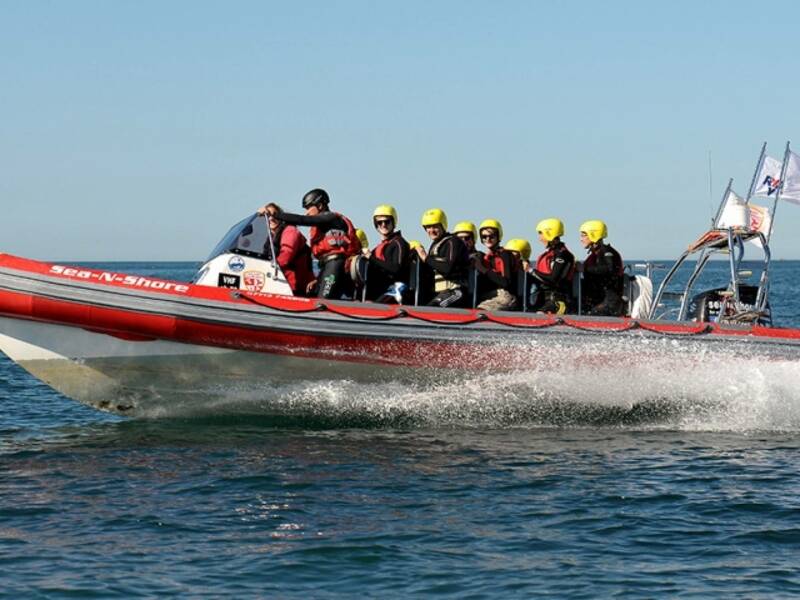 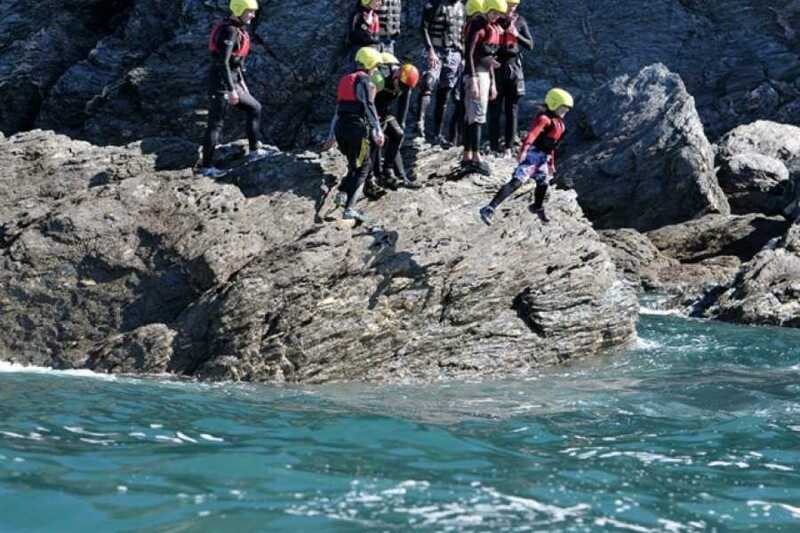 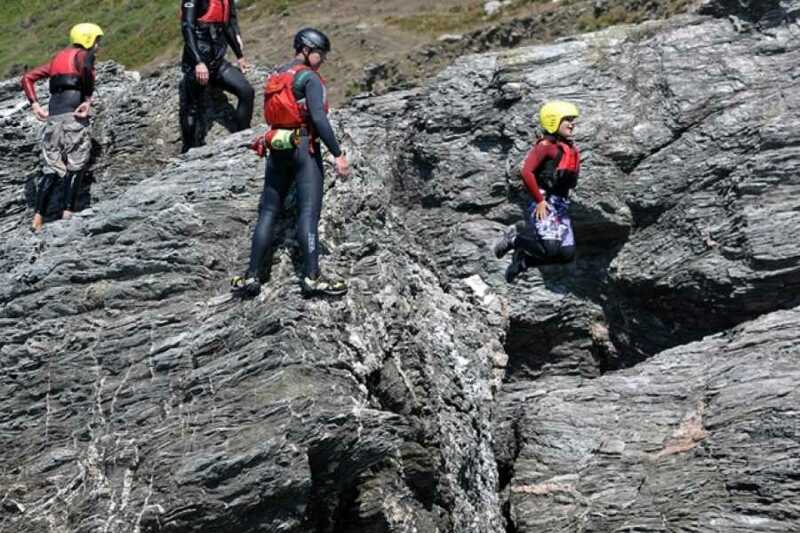 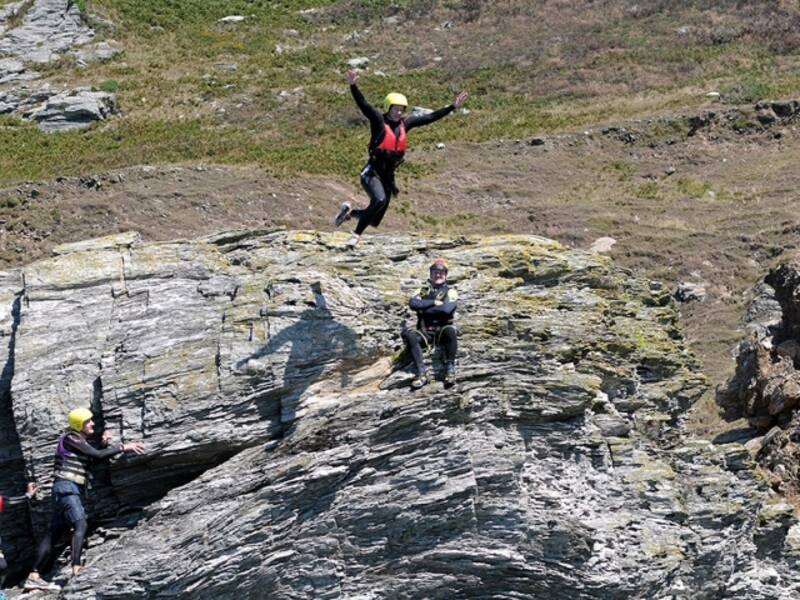 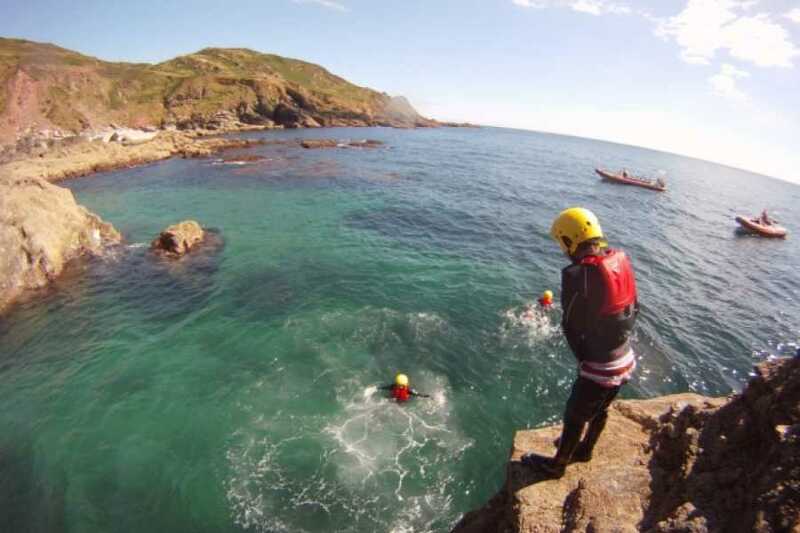 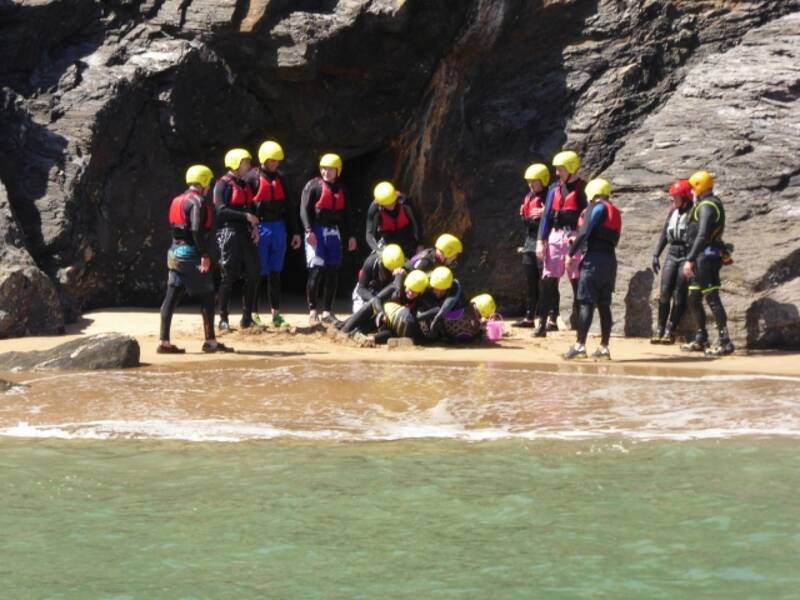 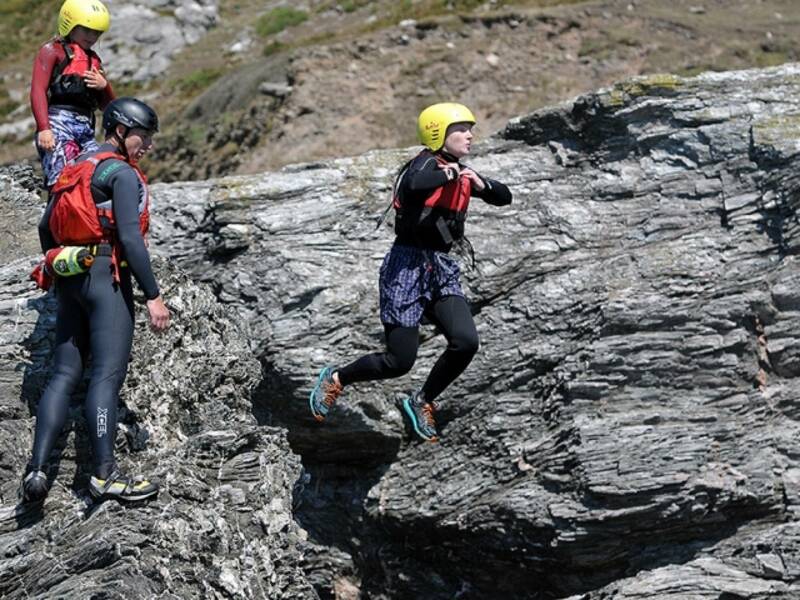 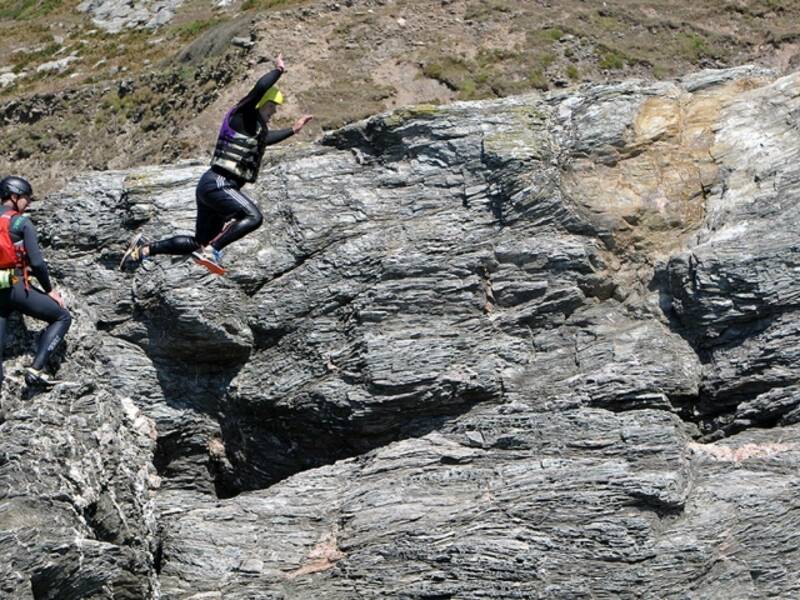 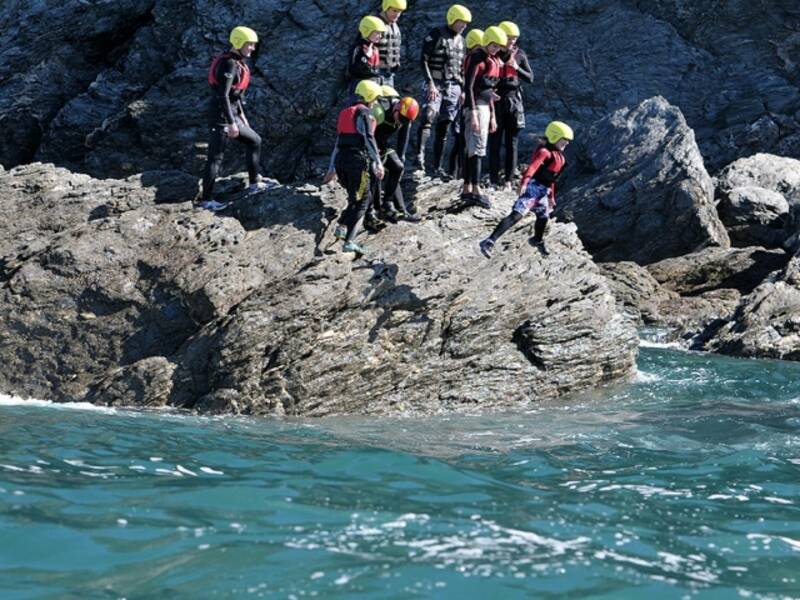 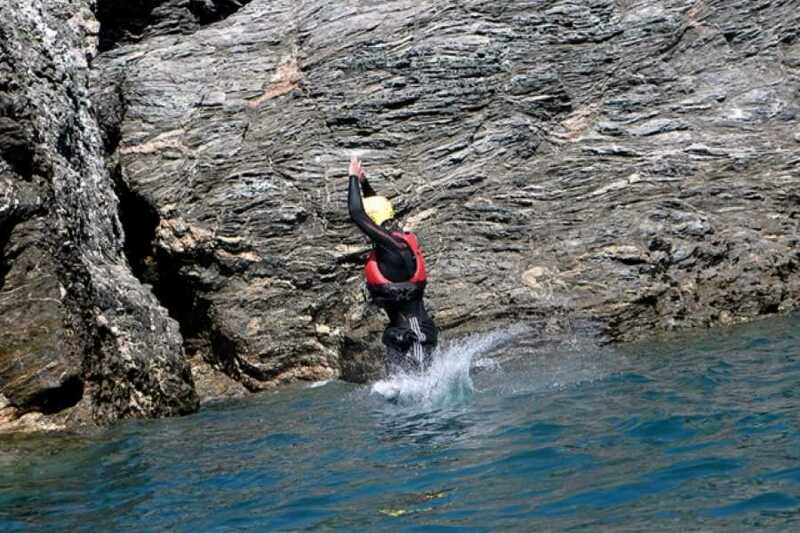 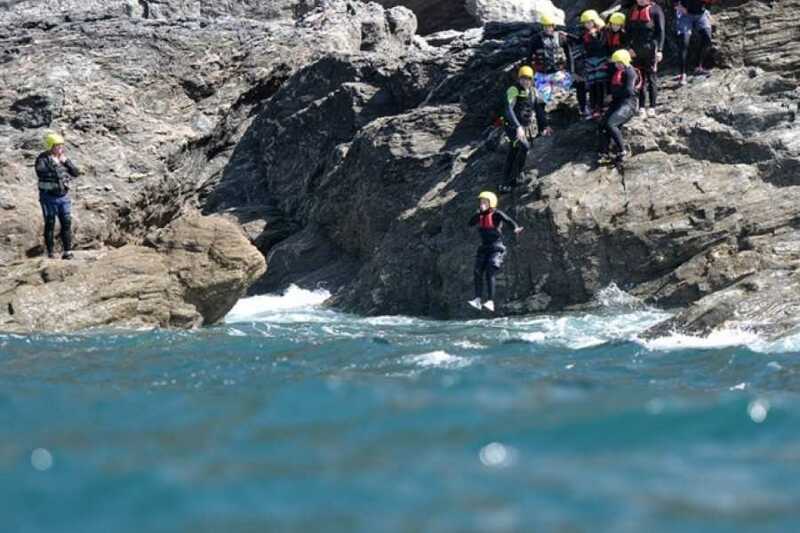 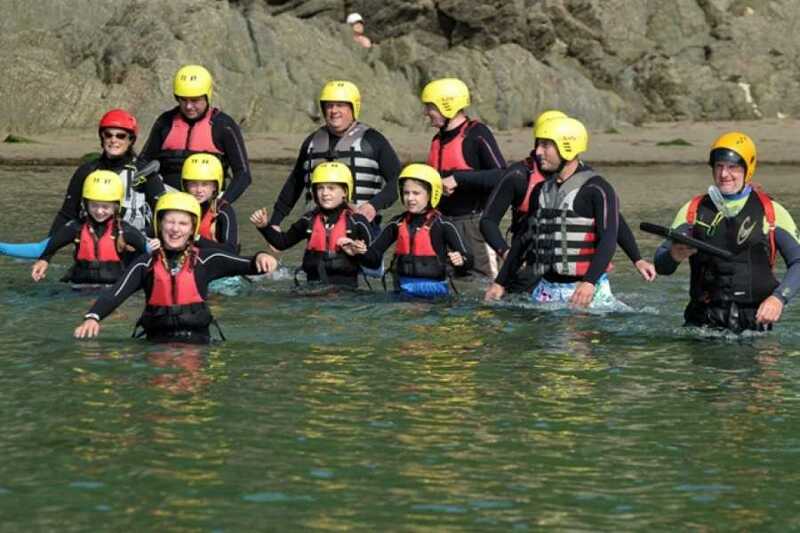 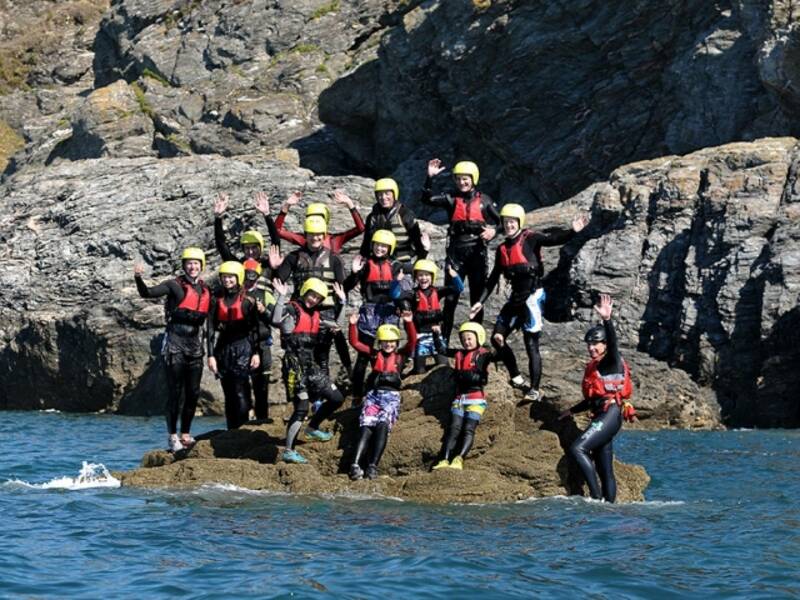 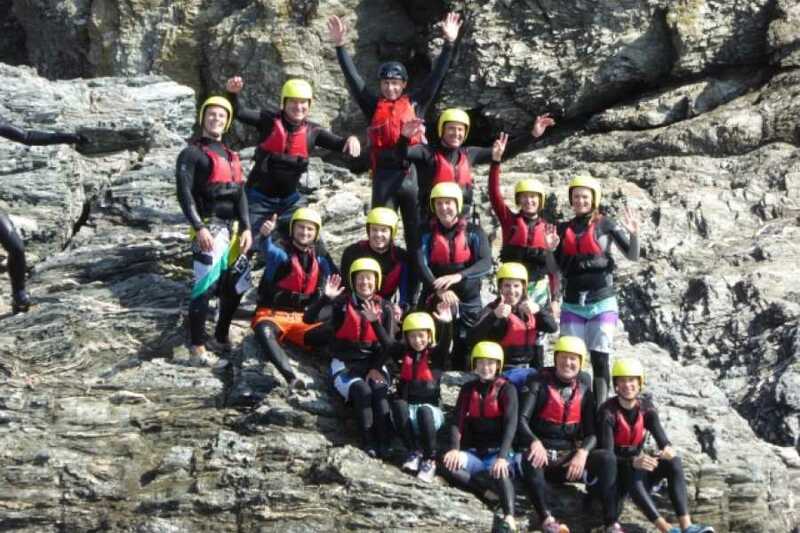 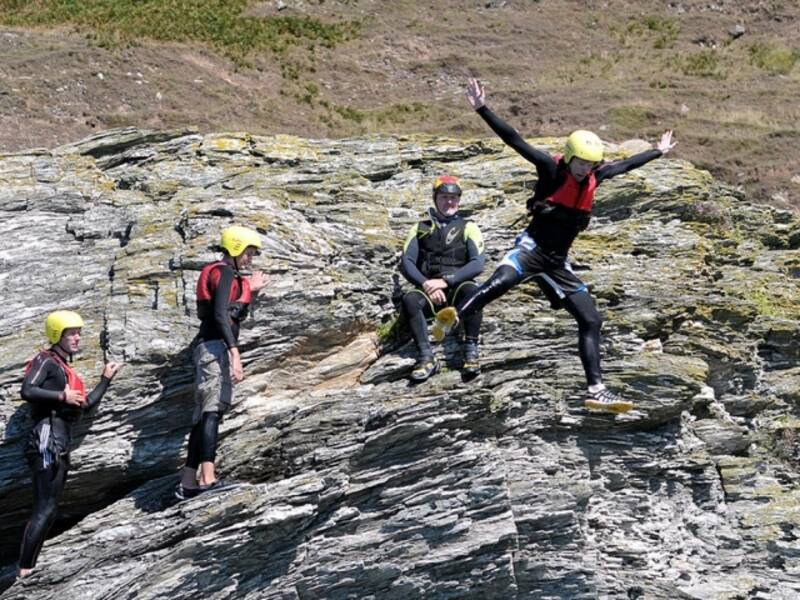 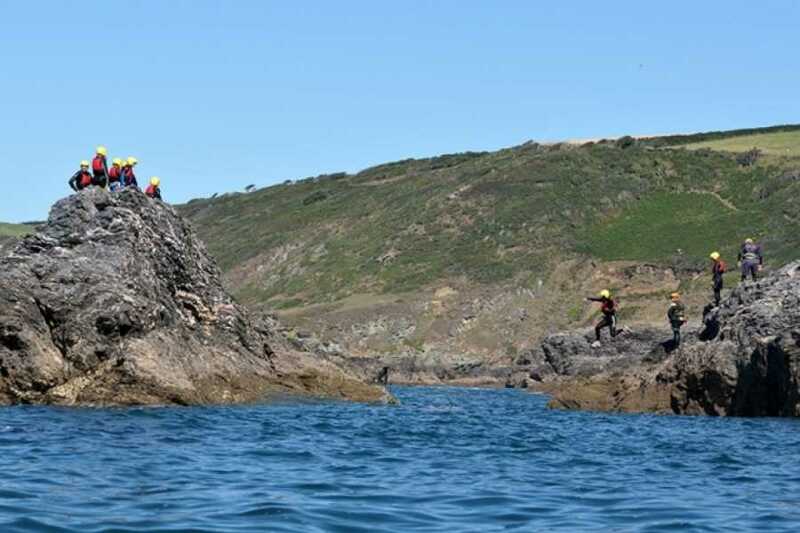 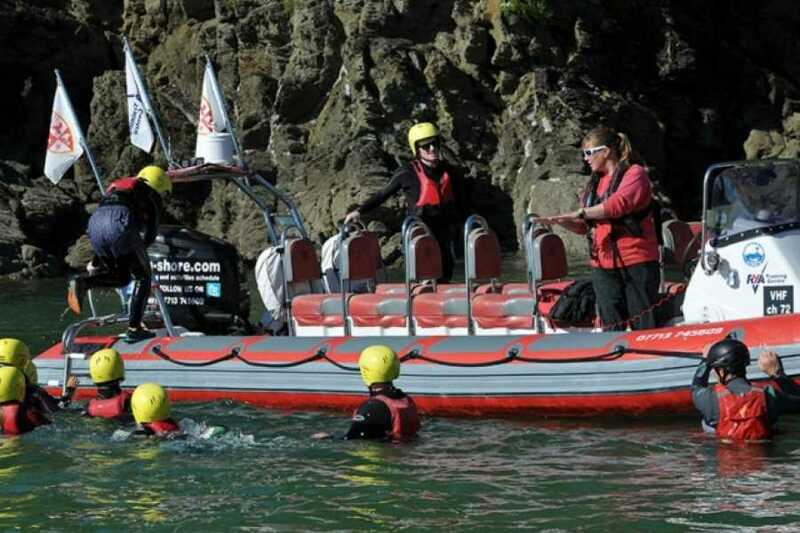 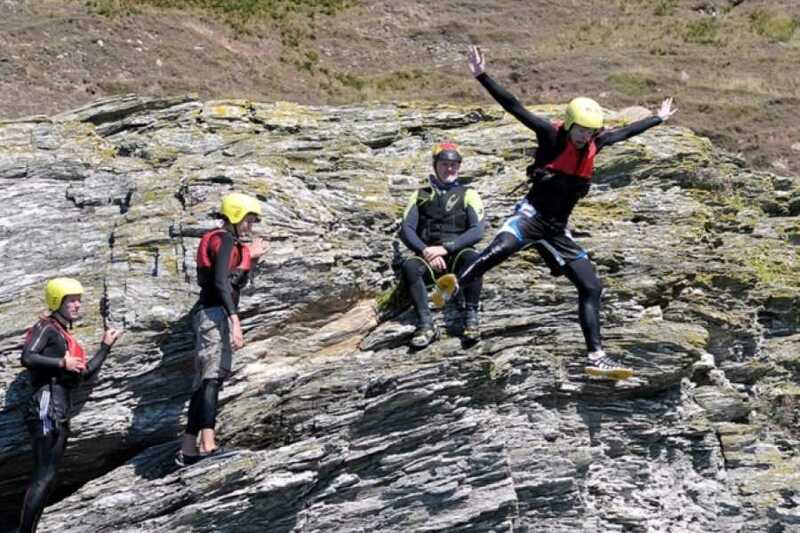 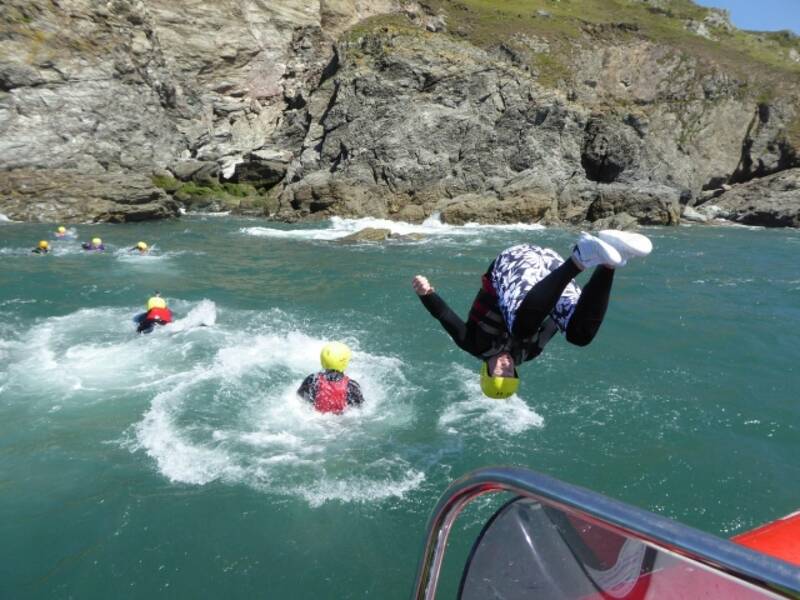 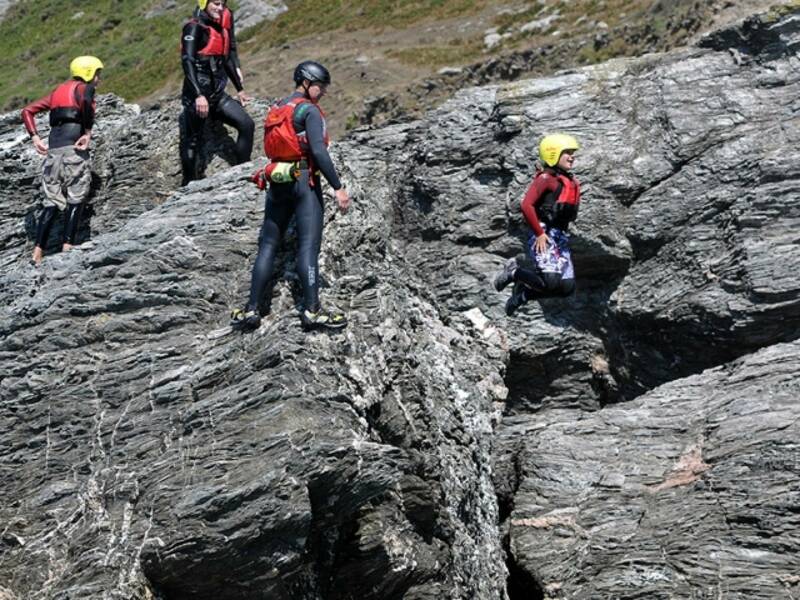 With the two big ribs, with instructors we then zip you around the coast at high speed to location where we then encourage you to jump off the ribs in style with the instructors and with a short swim, start rock climbing, exploring caves and gullies and lots and lots of jumps. 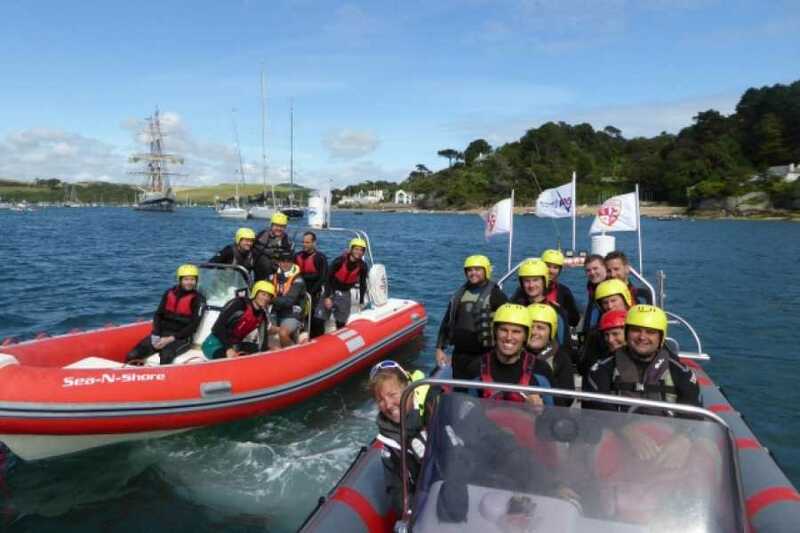 It is a fantastic group event and we take as many photos as we can from the ribs and go pros. 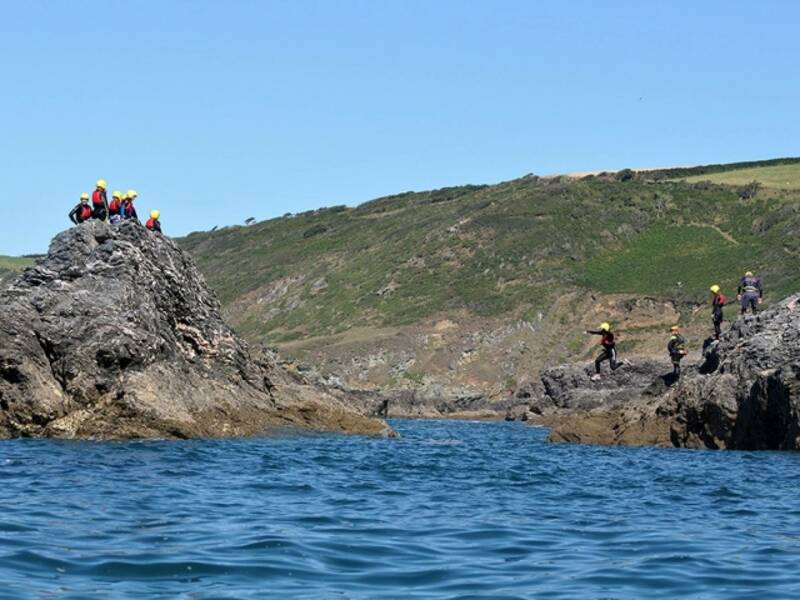 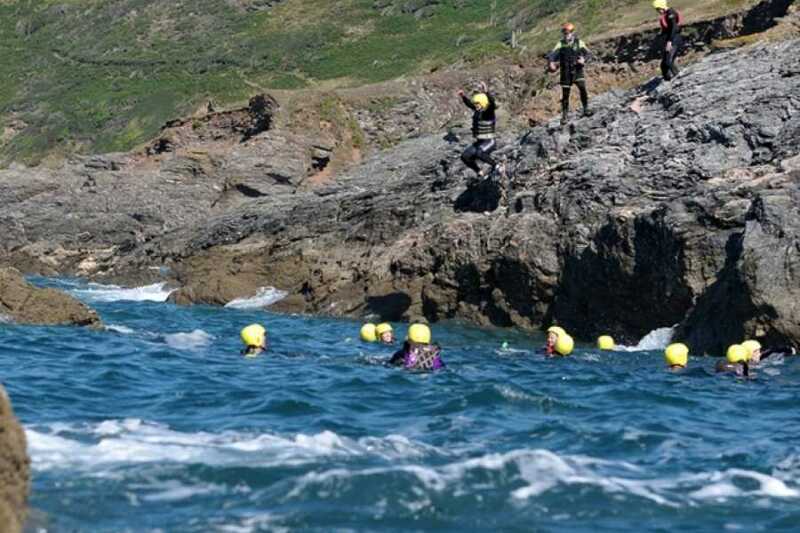 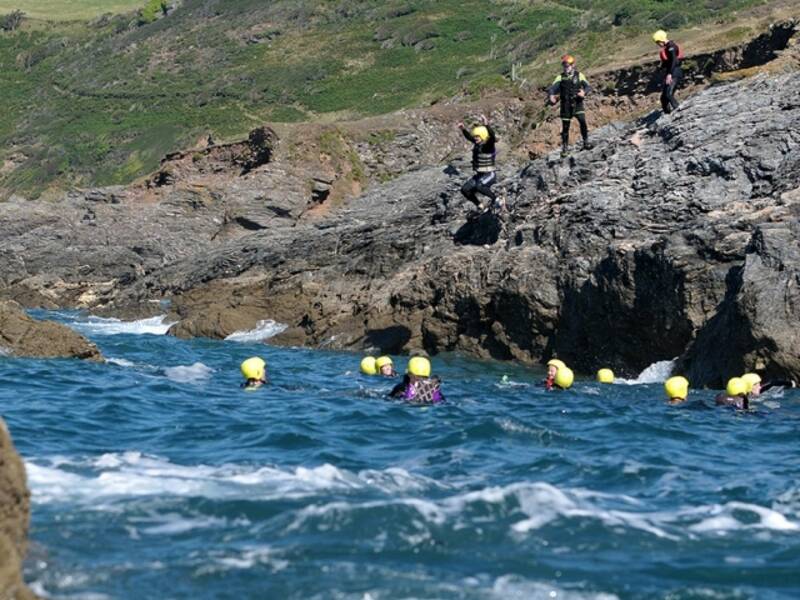 If anyone gets cold or tired, they can simply tell the instructors and we coordinate a short swim from the rocks back to the rib to then eat chocolate and warm up. 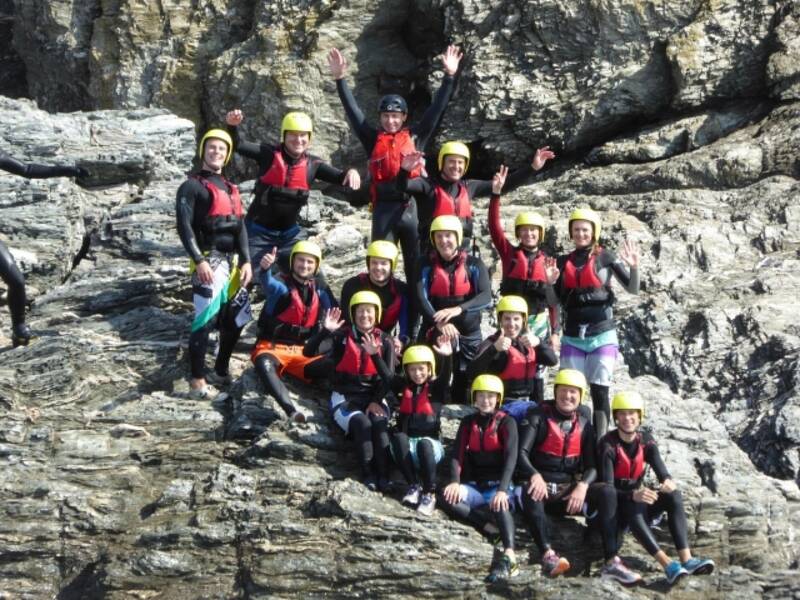 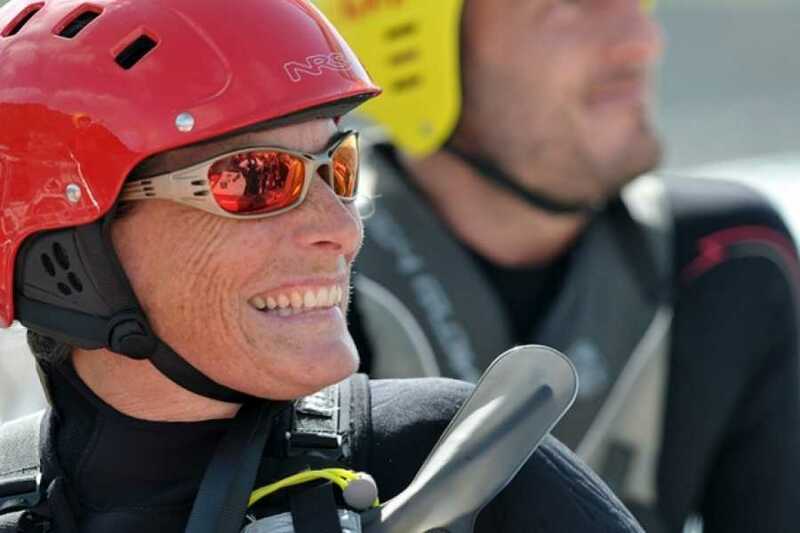 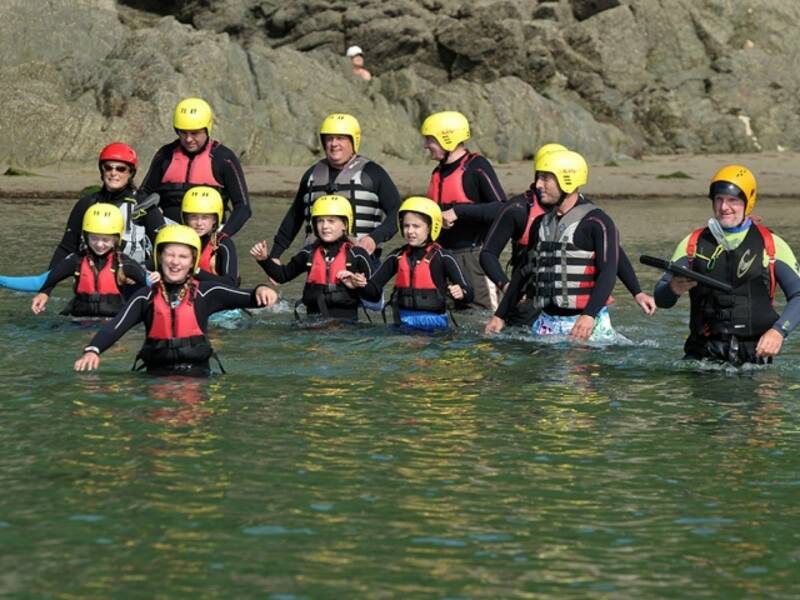 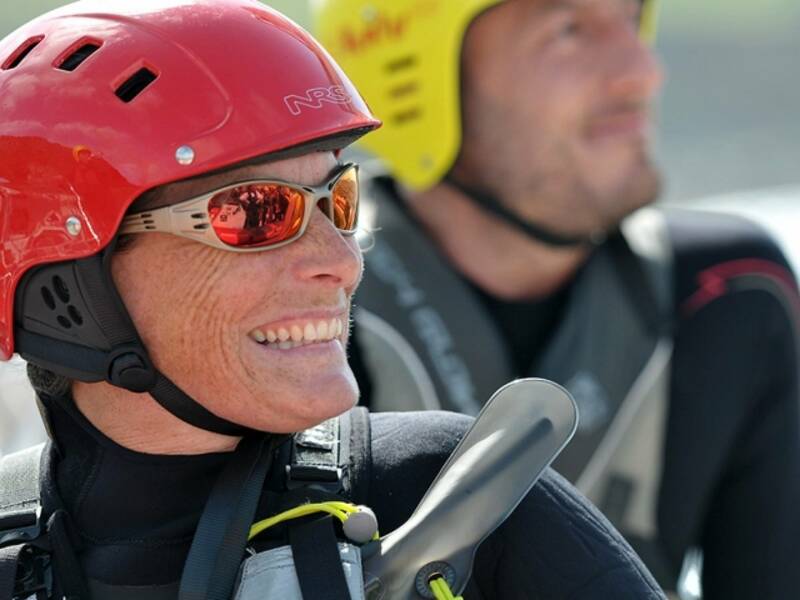 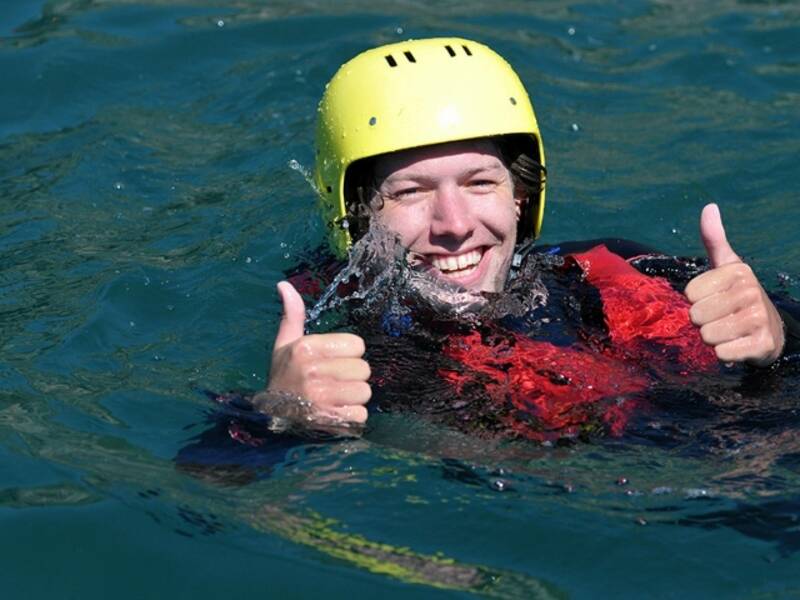 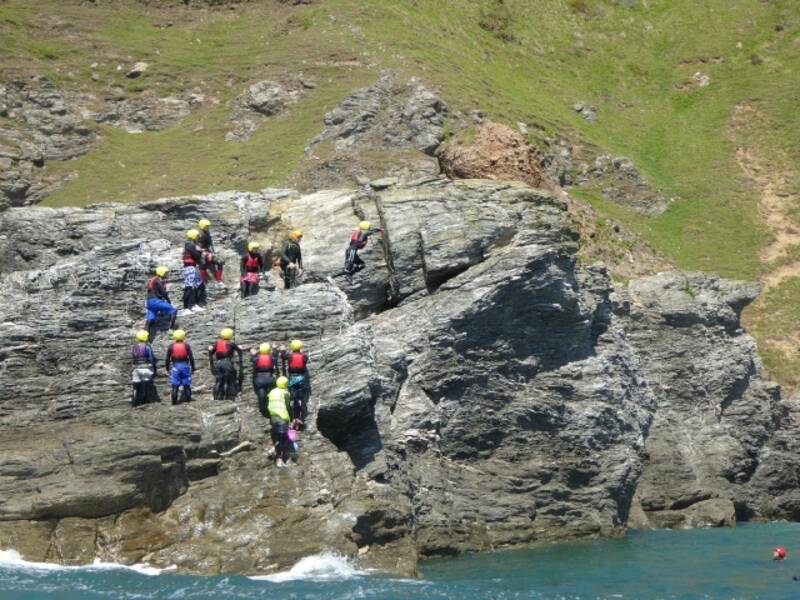 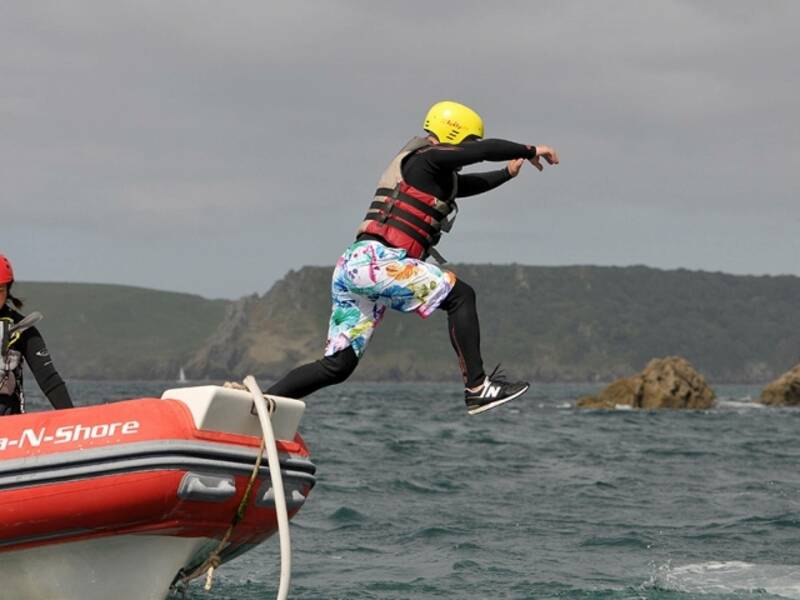 All our instructors are fully qualified and trained for every eventuality and we pride ourselves on making sure it’s as fun as possible. 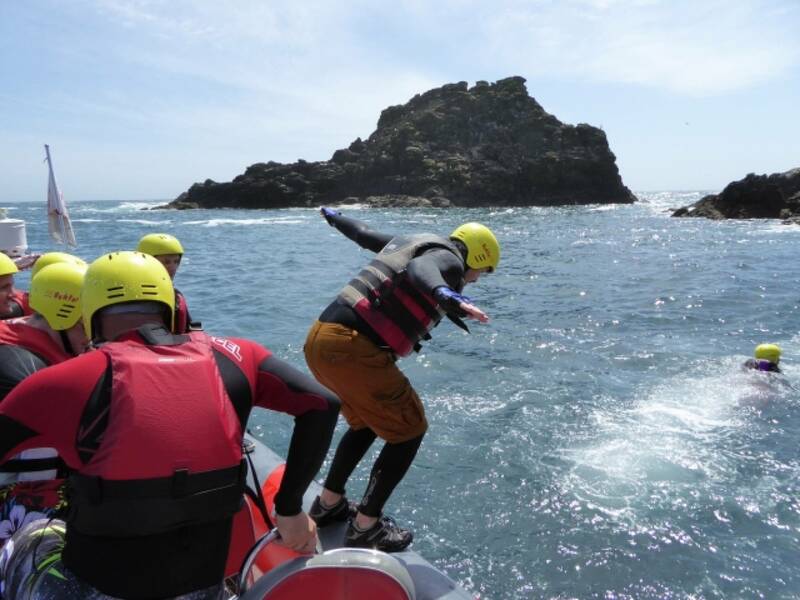 It is a sport where you do need to be of basic fitness and swimming ability, if you know of any issues with health or ability, can you let us know in advance please?